The English word “Christ” comes from the Greek Χριστός (Khristós), and means “the Anointed One”. It is equivalent to the Hebrew word מָשִׁיחַ (Messiah). According to the Old Testament scholar, Margaret Barker, the Messiah is the “Angel of the Lord’s Presence”, or the angel that stands in Elohim’s presence as his chief messenger. Early Christians equated Jesus with the Messiah and the Great Angel who would deliver Israel. “16And he came to Nazareth, where he had been brought up: and, as his custom was, he went into the synagogue on the sabbath day, and stood up for to read. “20And he closed the book, and he gave it again to the minister, and sat down. And the eyes of all them that were in the synagogue were fastened on him. “21And he began to say unto them, This day is this scripture fulfilled in your ears. “22And all bare him witness, and wondered at the gracious words which proceeded out of his mouth. And they said, Is not this Joseph’s son?” (Luke 3:16-22, see Isaiah 61:1-3). Isaiah 61 was a key prophecy regarding the coming Messiah. Yet, for those in Nazareth who knew him, this was blasphemous. The Messiah would not be born of someone like Joseph, whom they knew. Many others at this time had proclaimed to be the Messiah, promising to free Judah from the Roman captivity. However, as we study the New Testament, we shall see that only Jesus offered a different promise. In his mortal ministry, he would not offer physical liberation from Roman captors, but spiritual liberation through faith and repentance in the atonement. To preach the “gospel to the poor” meant preaching “good news” to them. He would heal the sad of heart, and would preach spiritual deliverance to those captive to Satan’s power. While he would literally heal the blind, he would heal even more who were spiritually blind so that they could again see with new eyes. They would be freed from the chains of death and hell, healed from the bruises brought on by sin and the struggles of this life. The gospels (Matthew, Mark, Luke, and John) as we now have them were written decades after Christ’s death. Most scholars believe Matthew and Luke were written based upon the writings of the earliest written gospel, Mark, and perhaps from another source named Q (Quelle, German for source). John was written in the 2nd century after the Book of Revelation. Some scholars do not believe these were written by the original apostles (Matthew and John) and missionaries (Mark and Luke). It may be that they were later written by followers of those leaders, who learned from their teachings about Christ. This was a very common thing done anciently, where the disciple would write a book and name their teacher as author. Whether the books were indeed written by the original Church leaders or not, the key is that these books are inspired. “1In the beginning was the Word, and the Word was with God, and the Word was God. “How does Jehovah appear in the Greek New Testament? As Kyrios. This gets translated as "Lord" in English. How does Elohim appear in the Greek New Testament? As Theos - especially Ho Theos [The God]. This, of course, gets translated as "God" in English. [In Isaiah] the Lord announces that he is the one and only Savior (see Isaiah 43:3, 11; 45:15). And when the angel appeared to the shepherds in he field outside Bethlehem, he said to them, "For unto you is born this day in the city of David a Saviour, which is Christ the Lord" (Luke 2:11). Now we may never really know what the angel's words were in the original Aramaic, but it seems reasonable that it would be something like, "a Savior, who is the anointed Jehovah." But don't just take Luke's word for it. In John 1:1-2 we read, "In the beginning was the Word, and the Word was with God, and the Word was God. The same was in the beginning with God." ... [T]he first and third "God" in this passage comes from Greek Ho Theos - the God - while the second occurrence was simply Theos. So this could be rendered, "In the beginning was the Word, and the Word was with The God, and the Word was God. The same was in the beginning with The God." (Russell C. McGregor and Kerry A. Shirts, "Letters to an Anti-Mormon," FARMS Review of Books, Vol. 11, No. 1, 1999, p. 139). So, we see that there is a distinction between The God Elohim, and his Son Jesus. Both are God, but are separate beings. The religious argument between one united Godhead of three distinct beings versus one God of one substance but three separate persons, has raged on for almost 2000 years. One of the earliest Christian teachers and defenders was Origen. Origen taught that the Father and Son were two separate beings, but both are Gods. He explained that Christ is a subordinate God to the Father, such as John 1:1 seems to tell us. This was the main belief for early Christianity regarding the Godhead until the times of Athanasius, Arius, and Eusebius of Caesarea. Over the first few centuries of the Christian era, Greek ideas trickled into the Christian church, including the idea that there is only one God, who is made of a perfect substance, while all other things are made of other impure substance. Arius belonged to the Eastern Church and taught that Father and Son were separate beings, and since there is only one God, Jesus was not God, but Lord. Athanasius, eager to defend the godhood of Christ, developed a different concept we now call the Trinity. It states that the Father, Son and Holy Ghost are one God, made up of three separate persons, but of one substance. The term “consubstantiation” or “homoousias” (of one substance) became key to his teaching. Followers of Athanasius sought to have Arius deposed as bishop, creating a huge rift in the Christian Church. To try and repair the damage to the Church and unity of his kingdom, Roman Emperor Constantine brought 318 bishops together in the first major ecumenical council at Nice in 325 AD. Eusebius of Caesarea is known as a key bishop of the time, as well as the best chronicler of early Christian history. Eusebius was an ardent student of the Bible scholar Pamphilus and devout follower of Origen. In the battles between Arius and Athanasius, Eusebius sought the middle ground, agreeing that Father and Son were separate beings, yet also stating that Christ was also God. When the Council of Nice ended, the Arians were temporarily routed by the Athanasians. The Trinitarian creed, also known as the Athanasius Creed, was set in place. However, for the next century there would be continued battles over this teaching, wherein the Arians almost succeeded in establishing their own belief. Eusebius agreed with certain tenets of the creed, such as Christ is eternal and uncreated. However, he drew the line at the term “consubstantiation” as it is not in the scriptures, and he insisted the gospel of Christ should be established on Biblical writings, and not on non-scriptural creeds. Today, while the majority of traditional Christianity follows the teachings of Athanasius on the Trinity, the Jehovah’s Witnesses tend towards an Arian view of God and Christ. The Church of Jesus Christ of Latter-day Saints (Mormon) holds a similar belief to the Origen/Eusebius belief that Father and Son are members of the Godhead, with Christ subordinate to the Father. As we can see from the Greek translation of John 1:1, this seems to be the correct interpretation. Christ IS God who is with THE God of all, Heavenly Father. December 25th is the traditional celebration for Christ’s birth. This date came about centuries after Jesus’ death, when early Christians sought to celebrate the date. 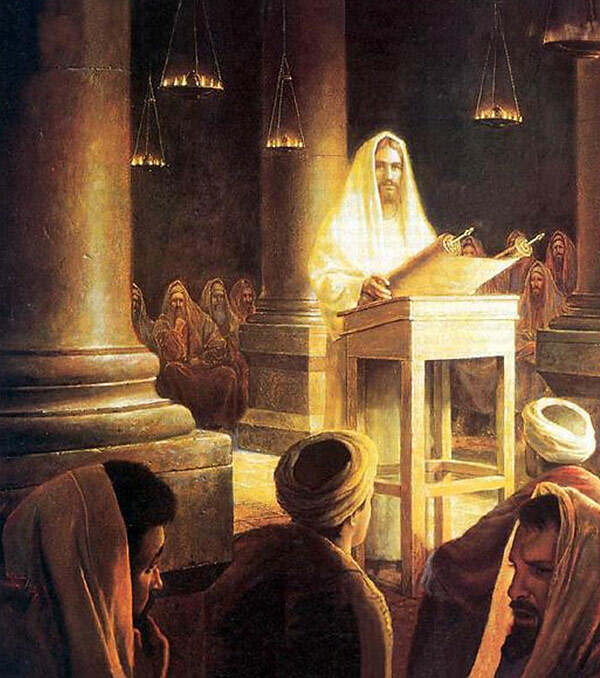 For about a century, Latter-day Saints have believed that Christ’s birth was actually April 6, 1 BC, based upon a reading of D&C 20:1 by Elder James Talmage in his book, Jesus the Christ. We have since found that verse one was not part of the original revelation, but was a header put in the revelation by the scribe. Also, more recent General Authorities statements and research clearly show that Jesus must have been born around 5 BC. Why? For one thing, Herod the Great, who spoke with the wise men and ordered the death of infants in Bethlehem, died in spring of 4 BC. Jesus could not have been born in 1 BC and still have Herod in the story. This and several other clues within the Bible and Book of Mormon suggests that Christ was probably born around December 5 BC. So December 25th could actually be the right date! I have always thought that one of the key indicators that Jesus was born in the spring was the fact that the shepherds were tending their flocks at night, which would indicate spring newborns. How does this fit into a December birth? Richard, we don't know when Jesus was born. December is traditional, and so we celebrate it. I personally lean to the Spring for his birth, myself. As for the April 6, 1 BC date that some read into D&C 20:1, we now know from the Joseph Smith Papers that verse one was added by the scribe as an introduction to the revelation. Only later with Elders Talmage and BH Roberts was it mistakenly interpreted to mean Jesus' birth day and year. I consider John Pratt a very good astronomer and thinker, however I think he's tried to take the concept of 1 BC from D&C 20 and force feed the data into it. Instead, we need to look at the evidence and follow where it leads us. And the vast majority of scholars, including those skilled in archaeology and history (which John Pratt is not trained in specifically) agree that Herod died in 4 BC, meaning Jesus had to be born before that date.